Cameron Smith has gone back-to-back at the Australian PGA Championship, finishing at 16-under to win by two shots over Marc Leishman at The Royal Pines Resort on the Gold Coast. Leishman looked to have the tournament in his grasp blasting out of the blocks making the turn with four birdies before relinquishing a two-shot lead with six holes to play. Smith played aggressive golf after beginning poorly and by the turn, with Leishman in the driver’s seat, Smith knew it was time to apply some pressure hitting driver off the deck on the par 5 12th into a strong head wind – a risk/reward shot that ultimately paid off. “I had to do something as Leish is such a good player and you cannot let him get away,” said Smith. Smith becomes the first player since Robert Allenby in 2001 and 2002 to successfully defend an Australian PGA title. Greg Norman (1984-85) and Ken Nagle (1958-59) are among the select group to achieve the feat. “It’s a great honour to come back and win again,” said Smith. Leishman was seeking to win his maiden Australian Tour title, despite being a multiple winner on the world tours. The Victorian applied the pressure yet Smith’s short game was simply majestic, neutralising any advantage Leishman may have gained during their afternoon duel in the sun. Costly mistakes by Leishman with bogeys at the 14th and 16th gave Smith a two-shot cushion with two shots to play and that was enough to close the gate. “A couple of shots obviously didn’t come out how I wanted them to,” said Leishman. “That horseshoe on 14 didn’t help. Lost a bit momentum really. I think Cam made birdies when he had to. All credit to him,” said Leishman. 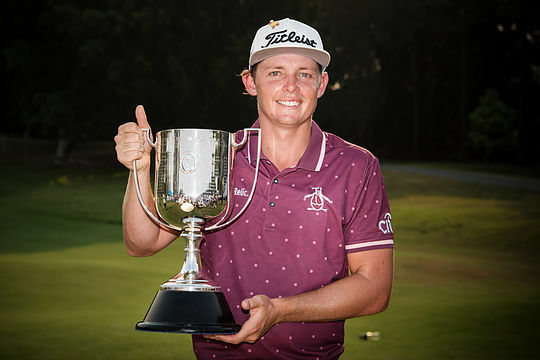 Jake McLeod took out the Australasian Order of Merit, which gives him a European Tour card until the end of 2019, effectively allowing the former Australian Junior champion to play Europe full time following a stellar season this year on the Australasian Tour, including winning the NSW Open and a 3rd place finish at the Australian Open. McLeod also has gained starts at next year’s Open Championship in Northern Ireland and two World Golf Championships. Matt Millar carded a four-under 68 to finish third alongside English bolter Ross McGowan, who finished at 11-under after coming from last on the cut line to shooting a course record nine-under 63 with nine birdies in his final round.